Sports betting has been around for many years now. Those who watch regular sports, are also usually familiar with betting as well, even if they do not follow it. Sports betting is one of the most common types of betting. There are different types of it, fixed odds betting and spread betting being the two most popular ones. In this article, we will learn more about the common types of sports betting and how they are different from each other. Fixed odds betting, as the name suggests, involves placing bets on fixed odds of winning and losing. That means, there are only two possible outcomes, either win or lose, and bettors are supposed to make wagers on either option. If your bet wins, you win the whatever odds were on that bet and so on. One benefit of fixed odds betting is that the bet amount is always fixed, and you can never lose more than the stake you invested. A common example of fixed odds bets is the moneyline odds in which you place the bet on the game outcome, irrespective of the point spread. Spread sports betting, on the other hand, involves betting on the change in score rather than the actual score of the teams. In this type of betting, the odds or prediction is usually in a range. For example, a prediction of 5.5 – 6 for the number of goals in a soccer game between two teams will mean that you can either place your bet on the higher score or on the lower side. If you bet on the higher score, the team will have to score more than 6 goals in order for you to win. The higher the team scores, the more you will win. The same rule applies for the lower bet. Spread betting gives you a chance to win more money by utilizing your sports knowledge in a better way. In fixed odds, you always know how much you can lose or win in a bet, whereas in spread betting, the profit depends on your accuracy and knowledge. The more accurate you are the more you will win. The probability of winning a spread bet depends on how much you know about the game, whereas the probability of you winning a fixed odds bet depends on how well your team plays. 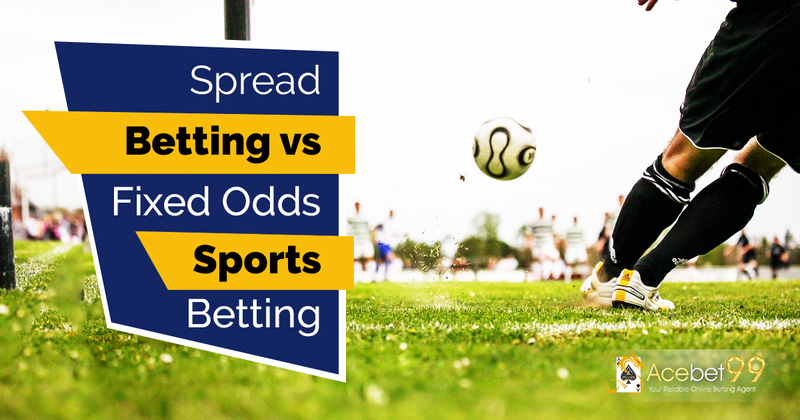 In fixed odd betting, you will either win or lose, but in spread betting, there are many more scenarios than just these two. Fixed betting is less advantageous yet more popular than spread bets because the risk is less in the former. Fixed bets, as well as spread bets are placed on almost every major sport, including boxing, soccer, American football, cricket, tennis, golf, baseball and more. Since you always know your potential loss in fixed betting, it is less risky than spread betting, where the potential of loss or win can be anything. In a fixed bet, your win will only depend on whether your team wins or not, whereas in spread betting, you win depends on the score of the team. The more (or less, depending on how you bet) your team scores, the more you will win. The winning amount in a spread bet also depends on how much you actually invest. By investing less you can win more in a spread bet, whereas the earning potential in a fixed bet is limited. Sports spread betting is mostly played through online sportsbooks, whereas fixed betting is still usually played through the same offline markets. The potential of benefits in a spread bet can be increased by choosing the right market to bet. Fixed odds betting is the simplest one to start with as it doesn’t require much knowledge of the game, but in order to win more in a spread bet, you will need to know everything about the game and the team you bet on. Fixed odd betting is much older than spread betting and dates back to the late 19th century. Fixed betting has two types – fractional odds and decimal odds. Spread betting also has multiple types, including season points betting, player goal minutes, the time of the first goal, goal scorer shirt number and more. Opening a fixed betting account is easier and needs less money as compared to a spread betting account. You can’t trade in spread bet when a stock is consolidating. Fixed betting is best for casual bettors, whilst spread betting is mostly done on a professional level. Both fixed odds betting and spread betting are popular in the sports betting market, however, the user base is quite different in each type. The risk is higher in spread betting and so is the reward. But if you are looking to just start in this market, we advise you to begin with fixed odds betting, as you will always have a control on your investment.